A New England Life: Have you been Naughty ... or Nice? Have you been Naughty ... or Nice? That's what Lily wants to know. So have you? Been Naughty or Nice I mean? Be honest now because Lily can sense when someone isn't telling the truth. She's very intuitive and reads people extremely well. You see those beautiful brown eyes? They can look right into your soul. I'm not so sure Winston's eyes can look into your soul ... but he has been a good boy. He's tried to be anyway. Does he look guilty? He sort of does, doesn't he. Either that or he has an eye problem. Could be both. I think Winston's a little stressed because he has to share the bed, and the sun, with Phineas. He's not always good at sharing with the cats. Something he needs to work on in the New Year. Lily still wants to know ... naughty ... or nice? And if you could have one thing for Christmas ... anything (be selfish here), what would it be? And please don't say world peace. As far as Lily knows there is peace in her yard and that's all that matters. * If Lily could have one wish it would be for her mom to stop being so lazy and take her for walks every single day. Even when it's only 15 degrees out, like today. *If I could have one wish it would probably be that Lily could live with me forever. Since a couple people mentioned it I thought I'd show you how Lily's holiday collar was made. It's pretty easy, though I didn't make it. Cut a piece of elastic to loosely fit your dogs neck. Sew the ends together. Measure out your decorative pieces of ribbon to however long you want them to be, then start tying them on. Mine are only tied once. You can use multiple colors, or one color. Add little sparkles or gems or whatever you like onto some of the pieces with a hot glue gun. That's it! If you have a cat you could probably make it in record time! Your babies are beautiful and should have world piece in their world. If I could have one thing, it would be a zillion followers! What an adorable post and that collar....I think I'm going to try making one right now for a Christmas present. Oh right you asked if I was naughty or nice. I'm going to say nice but my hubby would probably say naughty! Yes, you could paint and you have so many gorgeous photos to use as reference. I didn't realize you had pets (guess I've missed that completely). They are all precious. I want Winston! He has that perfect look of guilty innocence. Really sweet photos. What beautiful pets! I really love the photos of Winston and Phineas, and I love how you say Lily can see right into your soul. Very nice pet shots. Have I been naughty or nice? It depends on who you ask! I love the red farm buildings with the snow! Growing up I always wanted our farm to look like that, but it wasn't quite that pretty. You have a gift with the camera! For anyone who is interested I added photos of the Lily's collar along with a quick tutorial. It's pretty easy! It sure is a pretty farm isn't it JoAnn? I changed out the picture though and removed the textures. They just weren't cutting it. Now the farm looks as it should. I think I'm getting a little carried away with adding textures lately! LOL! Erica, Lily has always been my soul dog. Some dogs just bond so completely it's heart warming. Lily is one of them. Thanks for the collar instructions! Probably a new bug book! Sharon, your pets are just so cute and well groomed to boot! Winslow Homer sure could use a lesson in proper etiquette from them. I have been a very good girl this year, I think my husband secretly wishes I had been naughty! Very sweet babies and so so cute. That was a great post. I loved it. 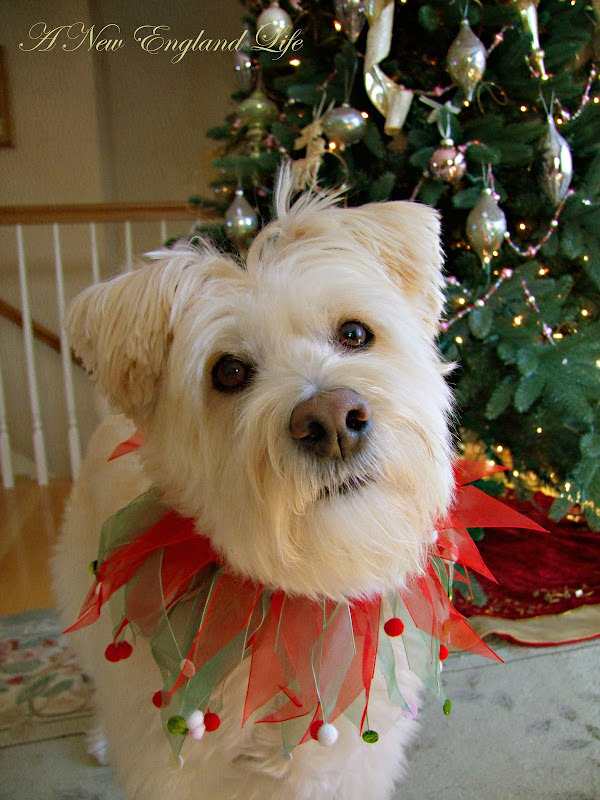 Lily and Winston are so adorable... great idea on the collar for the holidays. Wonder how long my dogs would wear it? Hmmmm. Precious, precious, precious, and I want to hug all of them, so do that for me, okay? LOVE the new header - is that my "Red" horse and barn? If I could have one wish, I'd wish a home for all the stray kitties and doggies in the world. Oh Lily is just too cute. Those eyes can talk. They really can. I'm not sure what I would ask for...thinking about it, I think I would ask for a more fulfilling job or an extra 8 hours in a day to find the time I need to write. Your pets are all beautiful and I love your pictures. I have been a very good girl :)) and what I want most in the next year is sell our house so we can move. Oh my gosh! I love your blog even more than ever - you have a pug!!!! 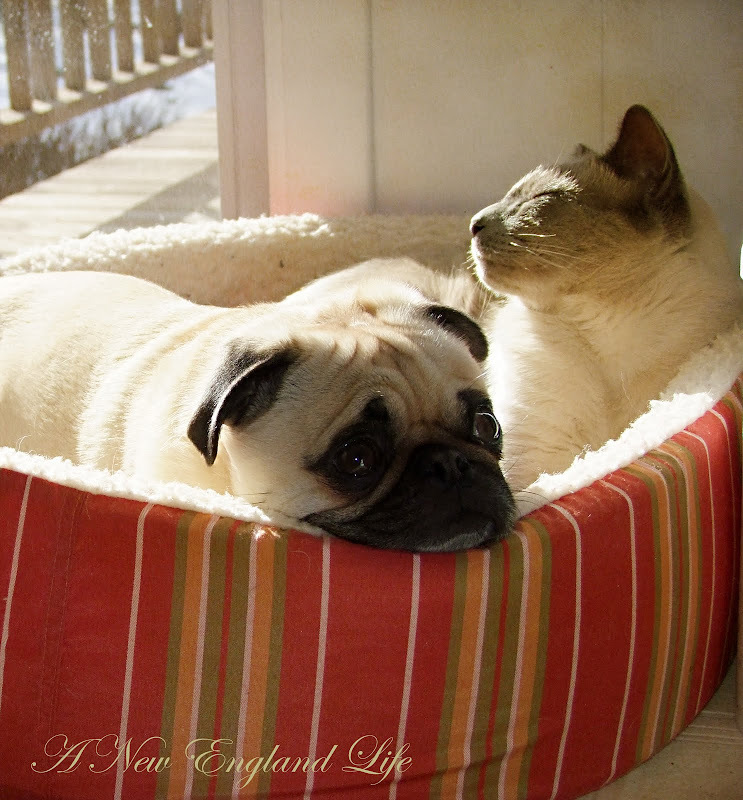 And even better...your pug sleeps next to a cat and I want that! A cat and a pug who are friends!!!!! Smiling here, your pictures are too cute! Happy Holidays to you ! 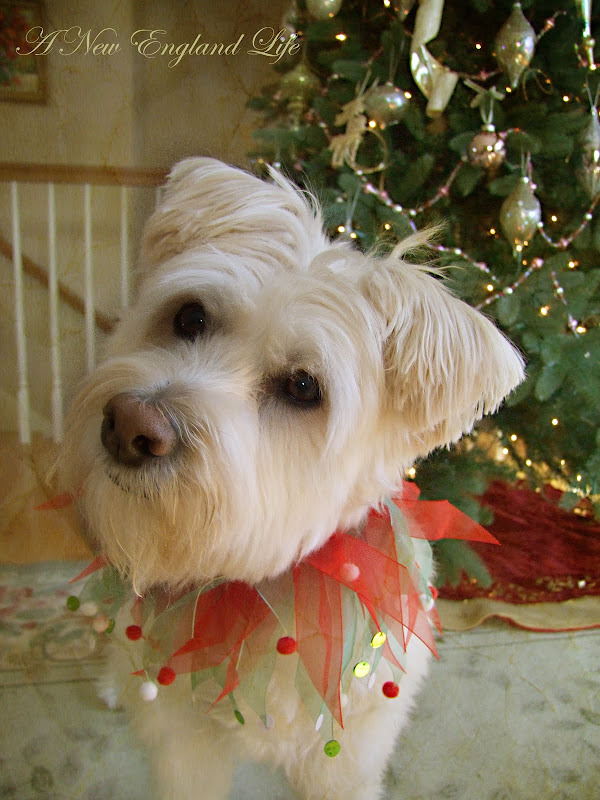 Lily is such a sweet girl, and she looks smashing in her beautiful holiday collar! All have been nice (enough) for Santa to come!! I love the collar and your photos and all the sweet family photos!! I'm with you about Winston, but Phin's conscience is definitely clear! 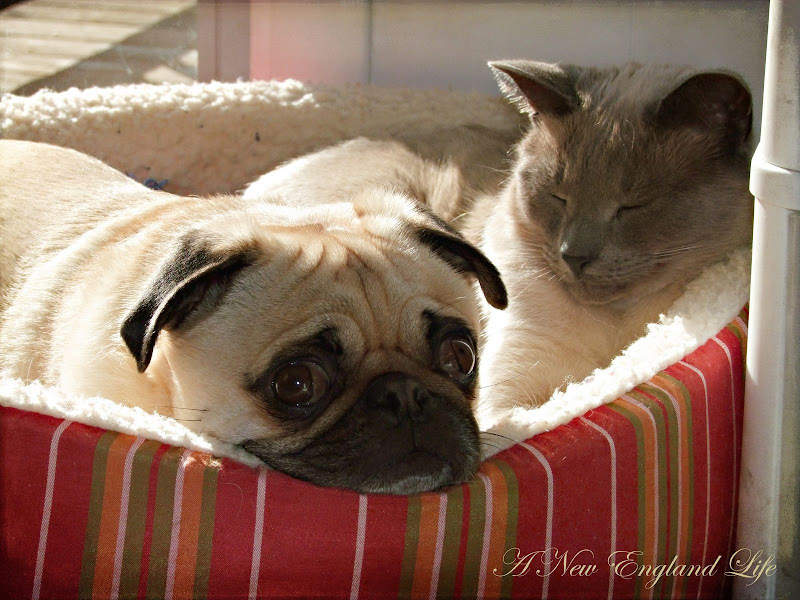 Great post Sharon, I love the pictures of some of my favorite critters in the whole world. Your house looks beautiful for Christmas!!! 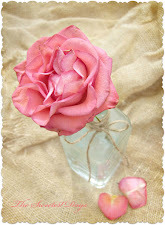 Such a beautiful blog!! Popped in here a bit ago and am finally leaving a comment. Your dogs are so sweet too and your photography is amazing. Thanks for sharing with us all!! I look forward to more frequent visits. I always describe myself as "naughty BUT nice" so I'm both. Lily looks adorable in her fancy dog collar. I love her inquisitive look. Winston indeed looks guilty, or has that "Oh, geez, I have to share my bed with a CAT?" look! If I had one wish, it would be to win the lottery, so I could help out family members who need money, plus pay off some of our bills, of course! You have such beautiful animal companions. I love the soft gray colour of Phineas. I also LOVE the collar. Thanks for the instructions. I'm having a few friends over for the holidays and little Celine will now be able to join the party dressed as the little princess she is. What would I want if I could have anything....? Well, the thing weighing most heavily on my mind at the moment are finances...so I'm going to choose something terribly boring and say Enough Money to be able to Give it Away Freely. That would cover a lot of my other concerns, as well. Although, I have to say...your wish that Lily could stay with you forever is an excellent choice. I love this series of pictures Sharon! Your furry friends are adorable and I love the barn picture. Thanks for sharing. Love your header picture, too. I am just catching up with folk's blogposts that I missed when I was in Florida so I am behind!!!! Hope your holidays are wonderful. This week it is to PLEASE not lose my pictures because my computer crashed...just brought it into the shop today (I am using my laptop tonight). Wish with me? I have been nice, not naughty. I could use a Xmas miracle to get it all back with my pictures saved!!!! Your babies are sooo cute! I just found your blog and it makes me miss home soo much! 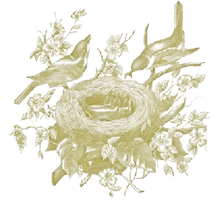 I'm now following you from http://xoxomamato3boysxoxo.blogspot.com! You brought tears to my eyes with your comment about your wish. Beautiful expressions from all your pets! Well today I've been very nice. Cleaned my Mother's home & put up her Xmas decorations. She's 86 years old & this Xmas has been very confusing for her. Winston does look like he wishes he had that bed all to himself!! so fabulous. And her collar is too cute, very festive. Tell Lily I have been mostly nice and sometimes naughty. One wish, huh? I wish all my unemployed friends will find work soon. Cool collar. And your photographs are absolutely gorgeous. I don't know why I haven't been around lately. All these posts that I've missed until now. 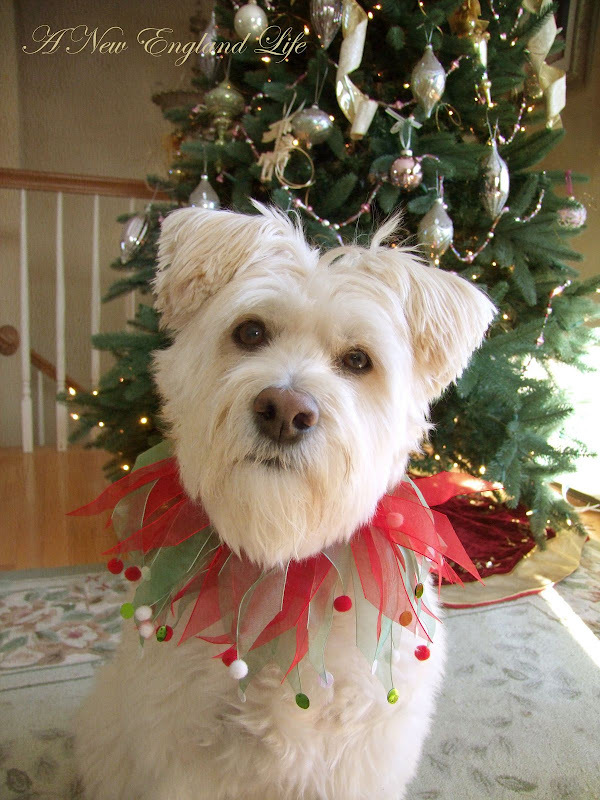 love the collar...so festive and lily looks so sweet with it on.